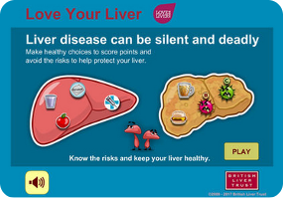 PLAY our game to learn about the risks of hepatitis B, C, alcohol and fatty liver which can lead to liver damage. Help save Liverbod's liver! A genetic disorder, haemochromatosis; long-term exposure to aflatoxin (a toxin found in mouldy rice, wheat, peanuts, corn and soybeans); smoking, long-term use of anabolic steroids and rarely a disease of the bile ducts, primary biliary cirrhosis can all increase your risk of liver cancer. Take simple precautions to protect yourself and your family. If you, your friends or family think you could have been exposed to liver damage, visit your GP or GUM clinic and ask for a blood test to check for viral hepatitis and/or liver function. Identifying viral infection and receiving effective treatment before liver damage has set in, reduces the risk of liver cancer dramatically. For alcohol related and non-alcohol related fatty liver disease, treatment will involve lifestyle changes and good diet and exercise with careful monitoring. If Cirrhosis is already present, regular screening will help to spot any early signs of Liver Cancer, when tumours are smaller and easier to treat.